The area between St Paul's Cathedral and Strand, that we cover on this eventful walk, loomed large in both the life and the works of Charles Dickens, and our route is duly crammed full with Dickensian locations. With the soaring splendour of St. Paul's Cathedral as the backcloth to our starting point you are in for some magnificent sights on which to feast your eyes from the off. And with the words and works of Charles Dickens to guide you, you really will get a true feel for London in the 19th century. We first encounter Dickens ascending the steps of the Cathedral to attend the funeral of the Duke of Wellington in 1852, an occasion he found so ostentatious that he decided there and then that, when the day came, his (Dickens's) funeral would be a low key affair. Leaving St Paul's behind we step into a series of atmospheric old lanes and courtyards to follow in the footsteps of David Copperfield to the site of Doctors Commons. It was here that Dickens, like David (or should that be vice versa! ), came to work as a freelance shorthand recorder in 1831, later claiming that the period was the "usefullest of my life." 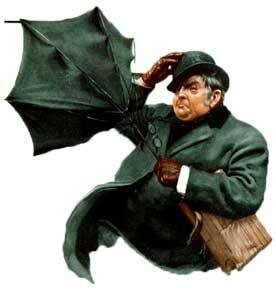 He also used it to great comic effect in his first major work Pickwick Papers. Having lingered here to listen to some of the things Dickens - through characters such as Sam and Tony Weller - had to say about this - now vanished - nook of bygone London, we move on through an intricate warren of medieval streets before emerging into the Square where in Oliver Twist Fagin's disciples would come pick pocketing on execution days. Looming over us will be the Old Bailey, standing on the site of Newgate Prison, London's most infamous gaol which, in his own words, held a "horrible fascination" for Dickens. It was here that Fagin spent his last night prior to his execution, and here, in the infirmary, in Great Expectations that Magwitch learnt on his deathbed that Estella was, in fact, his daughter. To the site of another infamous prison next, as we descend the banks of a forgotten underground River to visit the place where the Fleet Prison used to stand. It was here that Mr. Pickwick was imprisoned, at which point the work takes on dark overtones as Dickens relived the trauma of his father's imprisonment in a similar institution. 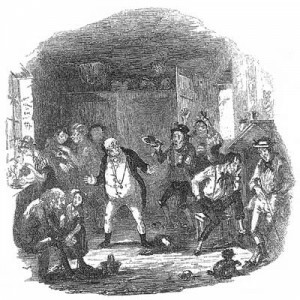 Richard will tell you of the hilarious exchange that brought Mr. Pickwick to the Fleet Prison, and will then discuss how Dickens's father's experience resurfaced in the Pickwick Papers. Lifting the mood slightly, we head for Fleet Street to see where Dickens dabbled as a newspaper editor by beginning his own publication the Daily News, albeit his temperament wasn't exactly suited to such a position and he lasted a mere few weeks in the job before resigning. Next up is the wonderfully named "Hanging Sword Alley" where the menacing Jerry Cruncher lived in A Tale of Two Cities. From here the tour enters a curious little alleyway, the walls of which are lined with tiled panels which tell the story of printing in the area and where you will see an example of how Charles Dickens work was plagiarised by unscrupulous publishers ever willing to jump on his bandwagon. This brings us to a true highlight of the walk as we enter an area that has changed little, if at all, since the days when Dickens wrote of it "you can read on its gates "who enters here leaves noise behind." It is a truly enchanting and timeless part of London and is crammed full with Dickensian associations. You'll see where Pip lived in Great Expectations; you'll visit the grave of the 18th century writer who inspired Dickens original pseudonym Boz; and you'll even see a 16th century dining Hall inside which Shakespeare performed and where Dickens didn't eat enough dinners. Don't worry Richard will explain! You'll hear how "stealthily one evening at twilight, with fear and trembling" Dickens posted his first manuscript through the letter box of the Old Monthly News, and you'll stand in the even older gateway where, a month later, Dickens purchased a copy of said magazine from a bookseller and was overcome with emotion to discover that they had published his story. And, betwixt and between, Richard will regale you with facts, anecdotes and gossip, which, when combined with quotations from the man himself, will almost convince you that you've been transported back to the Victorian Metropolis as you shadow the footsteps of Charles Dickens through streets, courtyards, alleyways and passageways that were, are, and always will be Dickens London. When planning your journey to the start of the Dickens tour, please allow 3 minutes for every station you will be through and then add 10 minutes to allow for any travel delays. I first did this walk in 1984 and the area through which we walk has changed a great deal since then. I have to say that the majority of those changes have been very much for the better. Take the area around St. Paul's, for example. 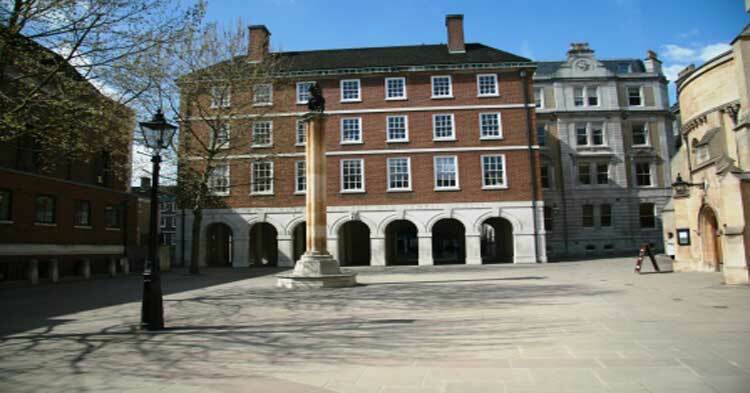 When I led my first group on a tour in the footsteps of Charles Dickens, Pater Noster Square was an ugly post war development. All that changed as the 21st century rolled in. The old square was pulled down and attractive buildings that perfectly complemented St Paul's Cathedral were put up. They even brought old Temple Bar back to the City and re-erected it alongside St Paul's Cathedral. The two together, both of which were known to Dickens, make for a truly memorable start to this Dickens Walk. 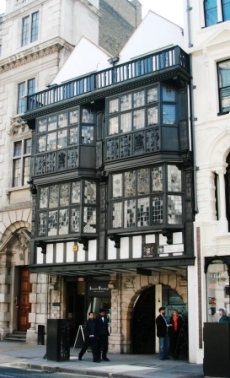 Crossing Ludgate Hill to delve into the intricate lanes and passageways of Blackfriars, it is still possible to find your imagination soaring back in time, not just as far back as Dickens age, but even as far back as the age of Shakespeare. In some of the old alleyways that we explore off Fleet Street I find myself constantly expecting Oliver Twist, Pip, Fagin, or even Dickens himself to come strolling past, that's how little they have changed. 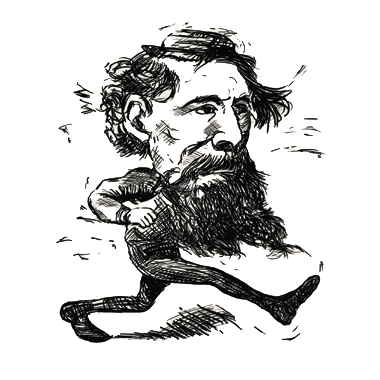 I hope to have the opportunity of welcoming you on to this Dickens walk, and of showing you around some of the places where Dickens comment "you can read on its gates who enters here leaves noise behind" is still as true today as when he wrote it. The Dickens Tour can be booked as a private tour for your office social, tour group, or even as an outing with a difference for a group of friends or relatives.